I've made a promise to myself to get back into the basics of scrapbooking and start doing more documenting! I used to do monthly pages for each of my kids, talking about what they are like at that time. But I've gotten away from that and so decided to record a little bit about my sweet daughter at 20 months. I decided to use some of the pretty strips from the bottom of the papers that I normally tend to throw away. I've used them at the top of my layout, as well as to make the banner that runs vertically behind my photo. When papers such as these provide such lovely (yet generally disposed of) details- why not use them? The June Kit "Dream in Pastel" is currently available- but there are only a few left! Visit the June section of the store to grab one for yourself! There are some add-ons and individual items available as well :). Thanks as always for coming by today! Be prepared for LOTS of upcoming posts in the next several days- I'm finding that the end of May and beginning of June are VERY busy for me- lots and lots of projects coming up :)~ so bear with me! Gorgeous page Erin!! Love the dimension and the way you have the tags peeking out!! Beautiful, Erin))))) The details look fabulous! Your lay-out looks truly gorgeous! I just love the soft colours and sweet details. So pretty! I love the tags peeking out of the photo and the sweet little butterfly on the flower. 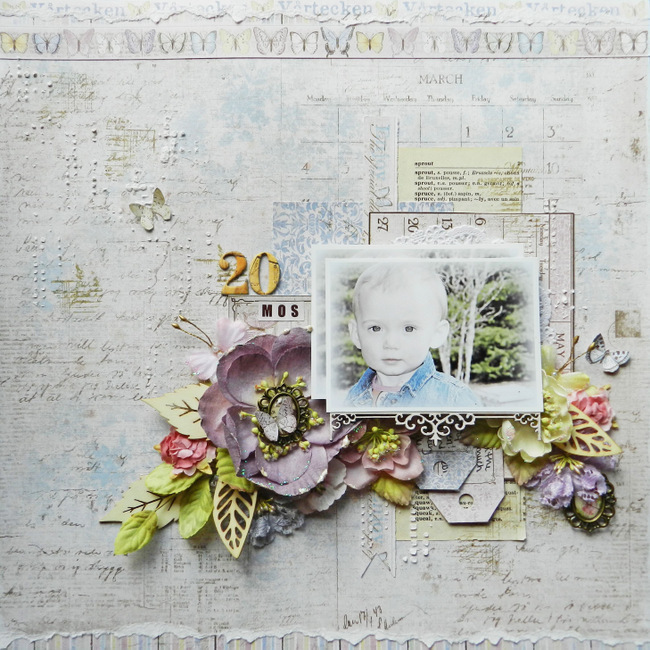 Oh so beautiful.. the photo is so cute, and all the flowers and layers are gorgeous.. love the texture on the back ground too.. another wonderful layout! layering, gorgeous, photo, gorgeous ... all. of. it. gorgeous!!!! Beautiful - she looks so serene!